After about a two plus hour flight delay I finally got into Roanoke, Virginia on Friday night. 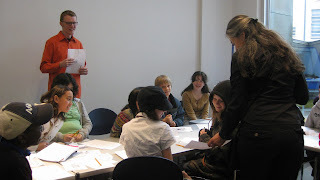 The purpose of my visit was to be a guest teacher of an anime and manga art workshop at the Taubman Museum of Art, which took place on Saturday. Following my late arrival, my host picked me up and showed me around a few Roanoke art exhibitions. First we caught the tail end of the opening for an exhibition at Roanoke College, which features gallery space of a significant size and quality. We intended to see another show at The Water Heater but ended up missing much of that due to my flight's tardiness. Finally, after fueling up on some sushi after a tiring time in transit, we pretty much called it a night. Saturday was the big day, and we got up nice and early for it. 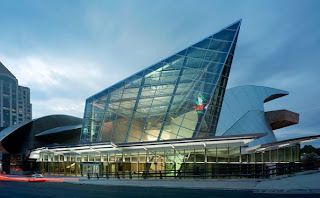 The Taubman Museum of Art is a gorgeous new building, completed just last year. Designed by architect Randall Stout, the building's forms are reminiscent of designs by Frank Gehry. Apparently Stout studied with Gehry at some point, as indicated by the museum's literature. So came as no surprise that I found the museum's interior spaces light and inviting, and find myself wishing this type of structure existed in Wilmington as well. The education spaces were very well designed from a utilitarian perspective, but seemed a bit small in comparison with the large open halls of the central atrium space. This became clear when the room filled with students attending the workshop, of which we had more than expected. I think we had close to 20 students, which got a little crowded but still manageable. I opened the workshop with a short talk about the historical and cultural background behind anime and manga. Starting with a mention of the foundations in ukiyo-e, and then moving onto the bombings of Hiroshima and Nagasaki, I intended to show how Japanese traditions, World War II, and the country's industrialization process were all major contributing factors in the creation of anime and manga. I then moved on to give examples of Astro Boy's connection to Disney, as well as popular motifs of robots and technology in the anime that followed. Half-way through my talk I touched on the anime boom of the 1980s, and the experimental work that came out of that era and the time after it. My examples included Akira and Grave of the Fireflies, as bringing back serious and historical themes dealing with Japan's history. This served as a transition into Neon Genesis Evangelion and Serial Experiments: Lain as taking experimentation in anime one step further. At this point, at the mention of Lain, I shifted gears and talked about the fine art movement that essentially started with Murakami in the 1990s. I showed images of work by Yoshitomo Nara and Takashi Murakami, and then moved onto examples of my own paintings at the end of the talk. It was probably only ten or fifteen minutes of speaking, which I think was the right length of time for this age group. Any more history and background information and I think they would have been bored to tears, but this seemed just right to hold their interest. We followed the talk up with some drawing exercises, a subject matter lottery, and continued to draw "cover" ideas for a comic book or manga. The workshop concluded with a short tour of the museum's exhibitions, which weren't all open unfortunately. In addition to the above photos, I put up an album on Facebook of the workshop. I should be getting a few more photos of that at some point, which I will add when the time comes. All in all it was a very productive workshop, and the kids seemed to enjoy it. So much so, perhaps, that some of them wished it had been longer. I on the other hand was more than ready for lunch at that point. We ended up eating at Norah's Cafe in the museum, which had excellent food and a very pleasing atmosphere. It felt cheerful and bright, even with the rainy weather outside. The rest of the day we spent with more visiting of art shows and gallery spaces. Most notably, the current exhibitions at the Hollins University's Eleanor D. Wilson Museum struck me as the best that I had seen in Roanoke. In light of only some of the Taubman's galleries being open, the exhibition at Hollins proved to be better than what the museum had to offer. The work of Vietnamese artist Binh Danh was especially powerful, warranting further examination and contemplation. That Saturday was naturally the highlight of my stay, as Friday and Sunday were marked by mostly being in transit and feeling funny. Altogether, the weekend was a great experience, but remained a fairly exhausting venture. I would have to say that what struck me the most about Roanoke is how, even though its size is not that much bigger than the Wilmington area's, the arts have taken on so much more of a vital role in that community. With the Taubman, a multitude of private galleries and alternative exhibition venues, and several school art facilities, Roanoke seems to be a very art oriented community. They even have an arts focused alternative high school (albeit not a cheap one). Most of the people I spoke with seemed to be very involved in the arts there. All of this served to contrast sharply with the tiny art scene of the Wilmington area, which makes me yet again dissatisfied with my current place of residence. I am now again thinking of the move that we feel might be coming up at some point this year. But for now I think I must simply remain patient.